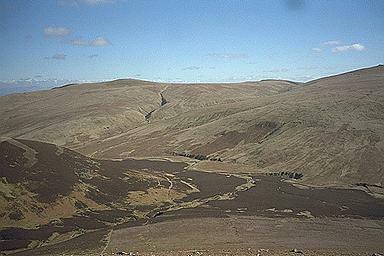 Bowscale Fell and Bannerdale Crags lie ahead riven by Blackhazel Beck. It is possible to descend to the valley path by the fence - a trace can be seen at the bottom of the slope - provided the heather is not too high by the beck down below. Unfortunately, one has to go down there to find out. I had only minor difficulties early in March. Larger version of this picture.